Welcome to The Mayfair Mall Zine - CD Reviews! 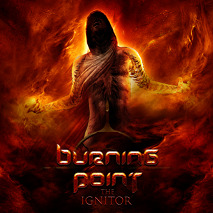 'Ignitor' is the latest album from Finnish Metallers Burning Point, a band led by vocalist and founding member Pete Ahonen and follows their acclaimed ‘Empyre’ opus. With 'Ignitor' the band have taken the very best elements of the previous albums and combined them with the new material to bring one of the finest Burning Point albums to date. The album mixes great melodies with powerful rhythms that will go down with both the Power and Melodic Metal crowd as well as the Hard Rock fans. This is brought to light from the off with the excellent opener ‘Eternal Flame (Salvation By Fire Part 2)’, with Ahonen at his vocal best. This is four minutes of sheer power infused metal. The powerhouse metal continues with the riff laden ‘In The Fires of My Self-Made Hell’, before the tempo but the not the quality is brought down a touch with the excellent ‘In The Night’ another towering riff spewn masterpiece with Ahonen delivering a mighty vocal once again. The title track ‘Ignitor’ is up next, this one has a darker edge to it but like the previous track its all metal. One of my favourite tracks off the album has to be ‘Silent Scream’, that starts off with a big chunky bass line the is the heart beat of the track, before the guitars explode into a cacophony of sound, then things take a more gentle refrain as Ahonen unleashes one of his finest vocals of the album, showing the dexterity of his vocals prowess. It's pedal to the metal once more as the licks come thick and fast on the rampaging old school metaller ‘Heaven Is Hell’, then its my favourite track of the album and one of the best Burning Point tracks ever, the magnificent ‘Losing Sleep’. This epitomizes what the band are all about, mixing Metal and melody in one tight power filled package. The full on Melodic Metal continues with the excellent ‘Demon Inside Of You’ and another slice of old school metal in ‘Everdream’, then it's another of my many favourite tracks on the album is the anthemic ‘Lost Tribe’. You will find yourself raising the metal horns in salute to this one, definitely one that will go down well live. The album closes with an all guns blazing metal monster, the breakneck speed of ‘Holier Than Thou’ will set the mosh-pits alive, which wraps up a quite astounding album the best to date for the band. Let's hope this gets them the recognition they undoubtedly deserve. All content copyright of The Mayfair Mall Zine unless otherwise stated.